Located in the Central Anatolian Region, Eskisehir is under the terrestrial climate. The summer months are hot and dry, the winter months are cold and rainy. The first settlement in Eskisehir (Doryleaum) is based on the date of 3500 B.C. Throughout its history; the city had been under the reign of Hittites, Phrygians, Persians, Romans, Byzantine, Seljuqs and Ottomans. Eskisehir located on the coasts of Porsuk River, is at one of the most important road junctions of Turkey. Eskisehir famous for meerschaum and thermal water springs which is good for several diseases was also the homeland for the historical personalities like Yunus Emre, Nasrettin Hoca. Eskisehir has a great potential for tourism with its natural beauties, cuisine and shopping possibilities as well as its cultural beauties. The districts of Eskisehir are; Alpu, Beylikova, Cifteler, Gunyuzu, Han, İnonu, Mahmudiye, Mihalgazi, Mihaliccik, Seyitgazi and Sivrihisar. It is an important district of Eskisehir with its rich historical structure. The ancient city of Santabaris, a religious center founded in the Roman period and preserved its significance in the Byzantine period, is located in the village of Bardakci at the 18 km. southeast of Seyitgazi, on the ancient road leading to the south. 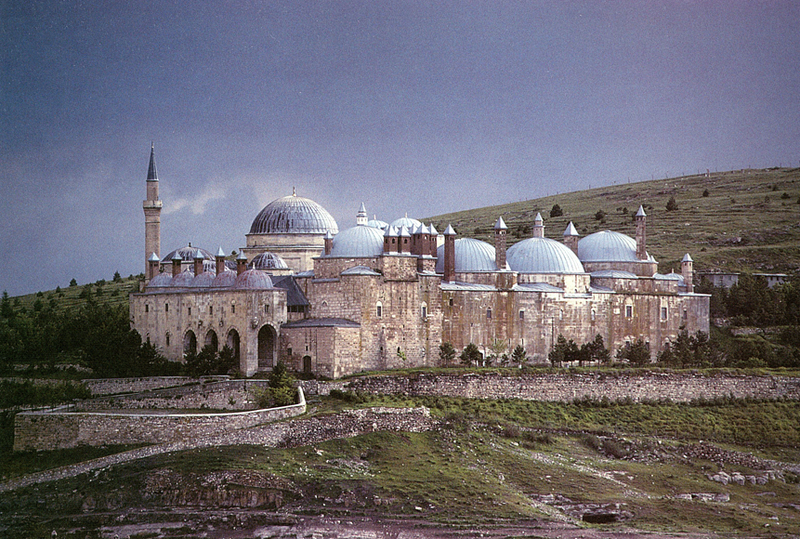 Seyyit Battal Gazi Kulliyesi (mosque, mausoleum and alms house) is located on the east slopes of the Ucler Hill in the district. 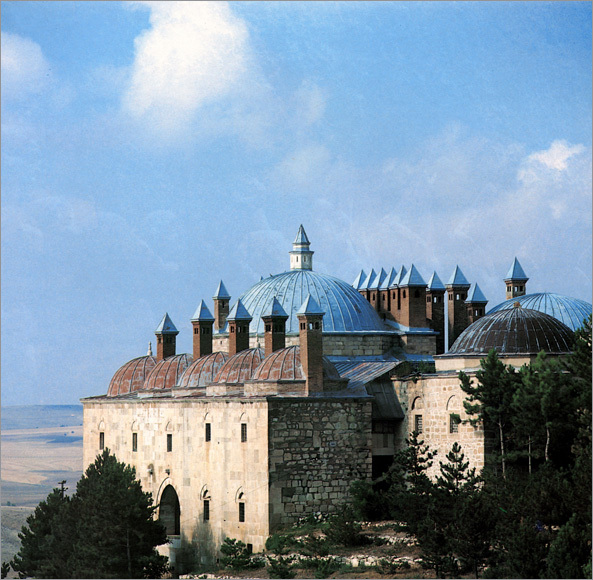 The kulliye of 150 meters height was built by Ummuhan Hatun, the mother of I. Alaaddin Keykubad in 1207-1208. 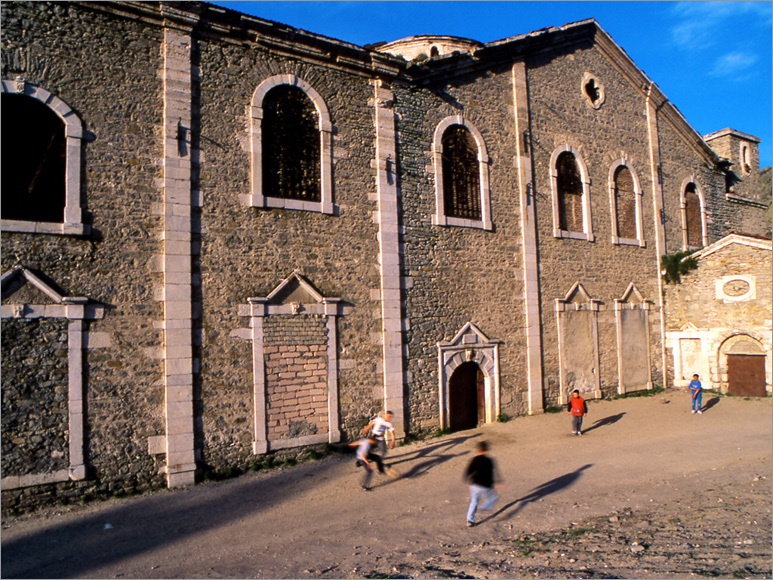 The religious school added by the Ottomans between 1511-1517, enriches the historical framework of the district. The Sucaeddin - i Veli Mausoleum located in the village of Arslanbeyli, 7 km. away from the district and Seljuq Bathhouse in the İki Cesme town are among the important historical works. The district, 86 km. away from Eskisehir, was founded in the Roman period. 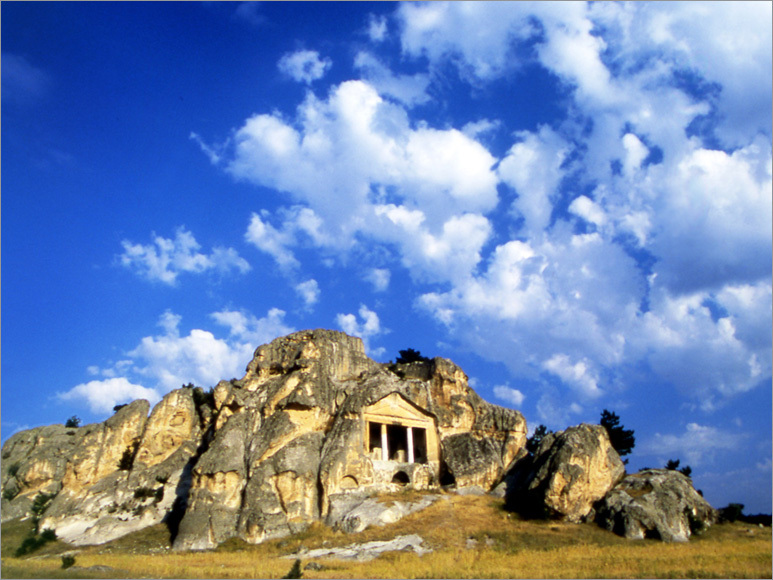 There are rock tombs in the district, which was a religious settlement area in the Byzantine period. The district had been one of the important centers of the Hittites, Phrygians, Romans, Byzantine and Anatolian Seljuqs periods. When it was an end dynasty of the Anatolian Seljuqs, a lot of works had been built, but few of these works succeeded to reach our times. One of the most important historical works in the district is Haznedar Mosque. This mosque is in the district center and it was built by the Minister of Finance (Hazinedar) Necibuddin Mustafa of the Anatolian Seljuqs. The miniatures inside the work are worth to see. Another important mosque in the center is the Kursunlu Mosque built by Seyh Baba Yusuf, in the place of the Seljuq mosque. The mosque has an elegant minaret and fountain. The city of Pessinus in the village of Ballihisar at 16 km. east of Sivrihisar is based in the period of the Phrygians. Pessinus, a big and well-known city in the history, was an important trade center. The works are being exhibited in three exhibition halls and garden in a chronological order. In the first hall of the museum, the plant and animal fossils belonging to the prehistoric ages and works belonging to the Neolithic, Calcolithic, Old Bronze, Hittite and Phrygian periods are being exhibited. The foundlings obtained at the Demircihoyuk excavation are also in this section. In the second hall, works and coins belonging to the Hellenistic, Roman and Byzantine periods and the works obtained from the excavations in Alpu Township Kocakizlar Tumulus and Sivrihisar District Ballihisar Village are being exhibited in separate groups. The third hall is reserved for the stone works. The marble offering statuettes, tombs from the Roman and Byzantine periods, Sarhoyuk (Dorylaeum) Roman period ground mosaics and foundlings at the Babadat excavation are being exhibited in this hall. Among the exhibited works in the garden, there are; marble statues, tomb steles, offering stones, tombs, milestone and earthenware pots and several architectural objects. The first part of the museum is for Ataturk which opened in 1970 and arranged to cherish the memories of the Great Leader Ataturk who visited Eskisehir 22 times between the years 1920-1938. There are Ataturk’s belongings and photographs in this part. At the second and third halls, there are ethnographic works brought from Topkapi Palace Museum and collected from the region, a collection showing the phases of the meerschaum, called as “white gold” in the region, from its extruding, operation to usage. The house is a typical example of wooden civil architecture belonging to the 19th century. The house belonging to Halil İbrahim Efendi (Sipahioglu), the parliamentarian of the Republican Period first term and known as the “Yesilefendi House” has also a significant aspect for hosting Ataturk here. The building, constructed in Baghdadian style, is composed of an upstairs above the cellar and ground. The attention paid for the wooden workmanship in the ceiling, doors and cupboards. The main room with oriel window and oven, is richer in ornaments than other rooms. The museum building, constructed with the hewn stone, is in Yunus Emre Kulliye in the village of Yunus Emre (Sarikoy). In the museum, there are certificates, accounting books belonging to the Yunus Emre lodge, books presenting Yunus Emre, parts of the first tomb of Yunus Emre reflecting the most beautiful examples of the Seljuq period stone ornamentation. 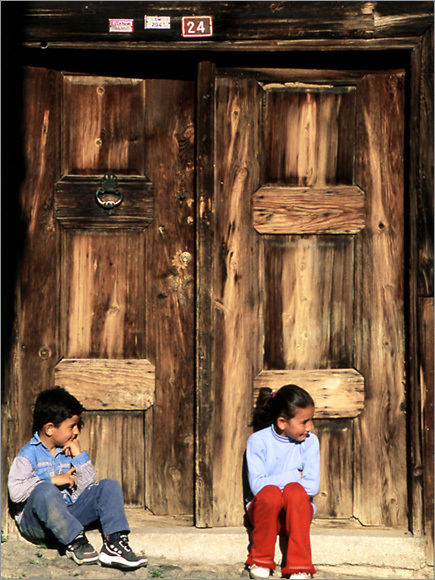 The museum is located at the teachers’ rooms and classroom sections of the Seyyid Battalgazi Kulliye. This structure is important, as it displays the architectural characteristics of the Seljuq and Ottoman periods. The region was the religious center of the Phrygians. It was an important settlement area, known as Nacolea in the Roman and Byzantine periods. Most of the works in the region belong to the Phrygian, Roman, Byzantine, Seljuq and Ottoman periods. Among the exhibited works, there is also the marble statue of Heracles portrayed with the fleece of Nemea lion in his arm and holding a child, which belongs to the Roman period and found during an excavation in Seyitgazi district center. Besides this statue, there are terracotta jugs-pitchers, architectural objects, marble statuettes, coins and seals, pots, weapons, swords, sanjaks, candlesticks, silver jewelry and clothes. The tomb stones belonging to the Seljuq period are being exhibited in the building as open exhibition. Kulliye is composed of the historical structures added afterwards to the mausoleum and mosque, built for Seyyid Battal Gazi at the beginning of the 13th century. In the kulliye which has the traces of three civilization periods, the mausoleum and mosque were built by Ummuhan Hatun, the mother of I. Alaeddin Keykubad who was one of the Sultans of the Anatolian Seljuqs (1207-1208). In the Ottoman period; structures like religious school, alms house (soup kitchen, furnace, etc. ), dervish lodge and dergah had been added to the kulliye (1511-1517). Although it is called as “Yazilikaya” due to the Phrygian writing on the monument, it took the name of “Midas Monument”, because there is the name of “Midas” in the writing. It was constructed for the mother goddess Cybele who was the only deity of the Phrygian religion in 550 B.C. The inner part of the cave was carved in the Phrygian period; it was used in the Roman and Byzantine period with additions. There are numerous carved tombs and passages. It is a rock monument belonging to the Phrygian period. It is based on the date of 5th century B.C. Nasrettin Hoca has an important place in the world humour literature with his jokes. 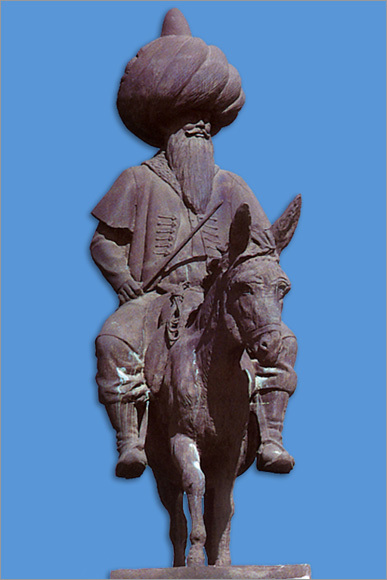 He was born in the village of Hortu of Sivrihisar in 1208. The commemoration festivals and folk literature seminars in the name of Nasrettin Hoca are being arranged in Sivrihisar district and Hortu village of Eskisehir every year. In the museum, beside the pipes there are jewelry, souvenir and objects to use and statuettes that participated in the national and international competitions. Four hundred works of over fifty artists are being exhibited in the museum. The ancient city, 90 km. away from Eskisehir, is close to the village of Yazilikaya. The relics of more than one civilization had been discovered in the valley. Midas (Yazilikaya), which was a settlement area in the early Bronze Age, was the religious center of the Phrygians. In the ancient city, there are also rock reliefs belonging to the Hittite culture. Moreover, there are numerous works belonging to the Phrygian culture like castle walls, settlement areas, rock reliefs, rock monuments, water cisterns, altars, rock tombs, niches and ancient roads in Yazilikaya. Most of the Phrygian works had been destroyed in the Roman and Byzantine periods and in those places rock shelters and rock tombs had been built. In the region from the village of Cukurca to the village of Kumbet, there are monuments, cult monuments, outdoor and nature temples, castle, tombs and several works. Pessinus, the sacred city of Cybele, who was the earliest goddess of Anatolia, is a Phrygian city located at 16 km. south of Sivrihisar district. It had preserved its holiness and importance in the Roman period. The ruins of stadium, theatre, temple, water channel and necropolis belonging to the city are still standing. The works obtained from the excavation of the ancient city are being exhibited in the museum at Ballihisar. There are ruins belonging to the Hellenistic, Roman and Byzantine periods. The works obtained from the tumulus are being exhibited at the Archeology Museum. The ancient city called as “Castle City” is 6 km. away from Eskisehir. The defense walls of the city have totally collapsed and only relics from the towers at the east and west entrances are standing. The ruins of headquarter buildings, cistern, roads and houses are visible inside the castle. The most important mausoleums of Eskisehir are the Seyh Sahabattin Mausoleum, located at the west of the Kursunlu Mosque and Seyh Edebali Mausoleum belonging to the father-in-law of Osman Bey, who is the founder of the Ottoman Empire. Moreover, Yunus Emre Mausoleum and Kulliye belonging to Yunus Emre, who is a bard calling people to love, unity and peace and Seyit Battal Gazi Mausoleum and Kulliye located at the eastern skirts of Ucler Hill in Seyidgazi district are important structures. Eskisehir is also on the forefront with its natural beauties. Geyik Area is a wonderful forest composed of Scots pine. Sarikaya Cave, Yelini Cave, Yelinustu Cave attracts the local cave addicts. Saricakaya, Sakarilica Thermal Tourism Center is one of the important tourism centers of Eskisehir. 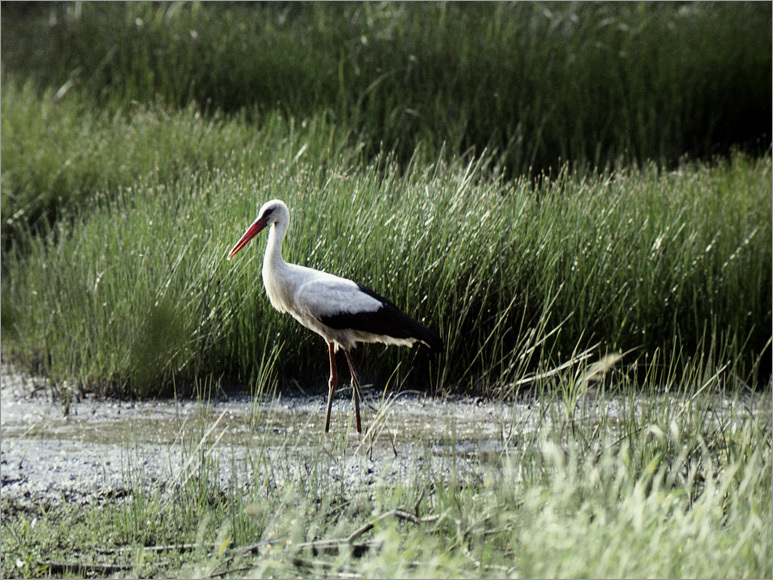 Eskisehir and its vicinity can be preferred for ornithology. Cerkez sofrasi (circadian meal), cig borek (raw pastry), katlama boregi (folded pastry) can be counted among the local food varieties, but cig borek should be especially tasted. If you come to Eskisehir one day, you can buy works, pipes and jewelry crafted from meerschaum special to the region as souvenirs.